Motorcycle rentals Sardinia - Olbia, motorcycle hire Sardinia - Olbia. The most convenient and cost effective way to RENT A MOTORBIKE IN SARDINIA - OLBIA, ITALY. You can rent everything via Motoroads.com - enduro, dual-sport or adventure motorbike, urban, street or sport bike, road, cruiser or touring motorcycle. We have it all - our Sardinia - Olbia motorbike rental fleet in Italy is built of reasonably priced new and used motorcycles available at low rental rates. We also offer, all kind of professional motorbike gear, accessories and equipment rental in order to make your motorcycle adventure safe and enjoyable. Being long in the motorcycle hire service, we know what you expect from us, and how to treat you - CUSTOMERS SAY IT ALL! Also, check our hot deals below for scooter rentals, atv-quad hire, bicycle rent and snowmobile rental in Sardinia - Olbia. Motorbike rental in Sardinia - Olbia is available 24/7. 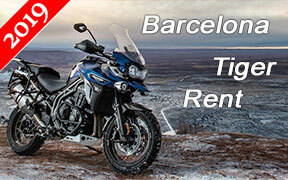 You can book your BMW, Triumph or Harley Davidson motorbike online instantly. If you would like we will deliver the motorcycle rental to your hotel in Sardinia - Olbia or at the closest airport if you arrive by airplane. Rent a motorbike and explore Sardinia - Olbia. We will provide you with road map and itinerary orientation for Sardinia - Olbia and Italy. Contact us for our motorbike rental services in Sardinia - Olbia.